Offers up improved in-body image stabilization and HDR 4K enhancements. 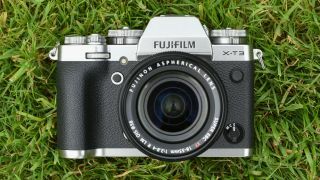 Fujifilm has revealed that some of its biggest cameras are getting a nice and juicy firmware update soon, which will offer a number of imaging enhancements. The Fujifilm X-T3, X-H1 and GFX 50S are all getting varying firmware updates, but it's the Fujifilm X-T3 that's set to get some of the biggest feature changes. Included in the Fujifilm X-T3 version 2.0 update is the ability to have 4K HDR recording in Hybrid Log Gamma (HLG). This will be compatible with the camera's 10-bit H.265 (HEVC) mode. The Fujifilm X-T3 will also get "simultaneous output of Film Simulation and F-Log footage". And there's more good news - when shooting movies, footage won't be split into 4GB blocks. If you shoot on the SD card, it will just keep on going. The Fujifilm X-H1 and GFX 50S are also getting firmware upgrades. The Fujifilm X-H1 will have improved image stabilization - essentially in-body stabilisation will now work better with OIS. The new firmware "has a new image stabilization algorithm to allow the in-body image stabilization to work in all 5 axis and to achieve more than five-stops (up to the equivalent of 5.5 stops) image stabilization by cooperative control according to the types of frequency and blur amount," explains Fujifilm. This update will be out in December. The Fujifilm GFX 50S is set to get a new 35mm format mode. This will be available when GF- and H-mount adapters are used. This mode creates a 30.5MP image by cropping to 36mm x 24mm. The GFX 5050 update will be out end of November.